sleek magazin issue #58 summer 2018 | MAGAZIN | UNTERHALTEN | ausberlin - das kaufhaus für produkte aus berlin. Produktinformationen "sleek magazin issue #58 summer 2018"
It’s undeniable that the worlds of art and fashion are pervasively white and privileged. As our cover star, the acclaimed filmmaker Melina Matsoukas, tells writer Lynette Nylander in an exclusive interview: “Even showing Black people living a normal life is political now because we’ve been written out of art in so many different ways”. 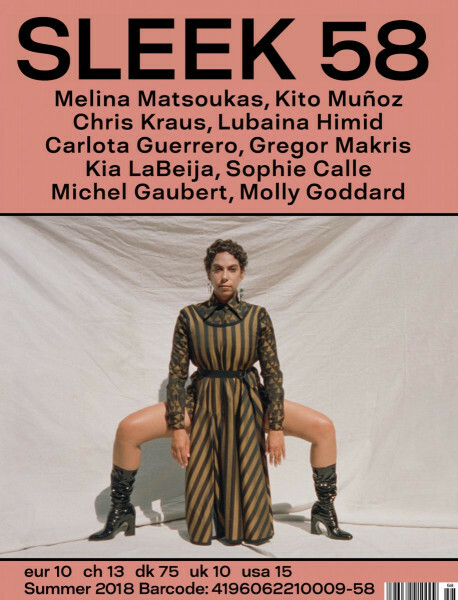 In the Summer issue of SLEEK, we wanted to move away from that gaze and feature leading artists, writers, photographers and creatives who offer an unsentimental view of the important cultural movements happening at the moment. Photographer and dancer Kia LaBeija in conversation with writer Fariha Róisín on art, identity politics and the stigma around being a HIV-positive woman in America. An interview with Lubaina Himid, the winner of the 2017 Turner Prize. A discussion with Sophie Calle on the problematic increase in women’s art being read as autobiography. Photographer Carlota Guerrero’s profile of transgender women in Havana, Cuba. Kito Muñoz’s summer fashion menswear shoot, “Heavenly Creatures”. Fashion designer Molly Goddard on her new book, “Patty” — a collaboration with photographer Tim Walker..
Acclaimed novelist and filmmaker Chris Kraus’s first column for SLEEK, on Kathy Acker and friendship. Weiterführende Links zu "sleek magazin issue #58 summer 2018"
Kundenbewertungen für "sleek magazin issue #58 summer 2018"